We never lack solid DVD converter, however, when it comes right down to the freeware, things are going to be more tricky. You have much more factors to consider before selecting a free DVD conversion software, like the ability to convert protected DVDs, supported OS - the latest Win 10 or macOS Mojave, the conversion speed and output quality. Without further ado, we list best of the best, read the detailed review, and pick out the one that meets your needs, whether you want to rip DVD into your computer to keep them safe, save a lot of time on searching DVD movie which you want to enjoy at times, or play DVD movie with your portable devices such as iPhone, iPad, iPod, PSP on the way. Notice: This list of free DVD converters is provided for information only. We DO NOT advocate any violation of the valid rights of copyright holders. You're strongly suggested to consult your country's copyright and fair use laws before you use any DVD ripper. 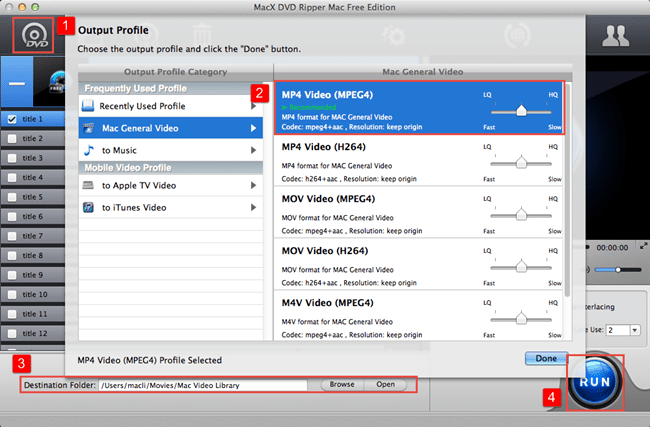 Review: MacX DVD Ripper Mac Free Edition is a free DVD converter for Mac without watermark. It converts (homemade and encrypted) DVDs to MP4, MP3, AVI, MOV, M4V, iTunes, Apple TV, any video formats you need. What is worth noting is that the free DVD decrypter can decrypt and copy encrypted DVDs by bypassing DVD copy protection automatically, be it CSS, Region Code(1-6), UOPs, Sony ARccOS, etc, which is difficult to find in a free DVD to MP4 converter. You can use the best DVD converter freeware to copy new DVD releases to iPhone, iPad, game consoles, Samsung, Android mobile devices directly if you are confused with various video formats. 36× faster real time DVD conversion speed is a big highlight thanks to Hyper Threading Technology used by the free DVD converter for Mac. For serious users who want original output quality, the free DVD conversion software gives nearly original DVD image quality. The best DVD ripper for Mac can run on Mac OS X, including the latest El Capitan. Review: Handbrake is a good free DVD to MP4 converter with plenty of output profiles supported. It's open source and cross-platform, but note that the free DVD converter can not run on OS X 10 El Capitan and Win 10. The free DVD ripper deals with homemade non-encrypted DVDs fast, however, it lacks the ability the rip copy protected DVDs. Output quality the free DVD converter delivers is OK, the interface is a bit more complicated, but if you are not a person who hates tech stuff, it won't be a problem to get hang of the free DVD conversion software. 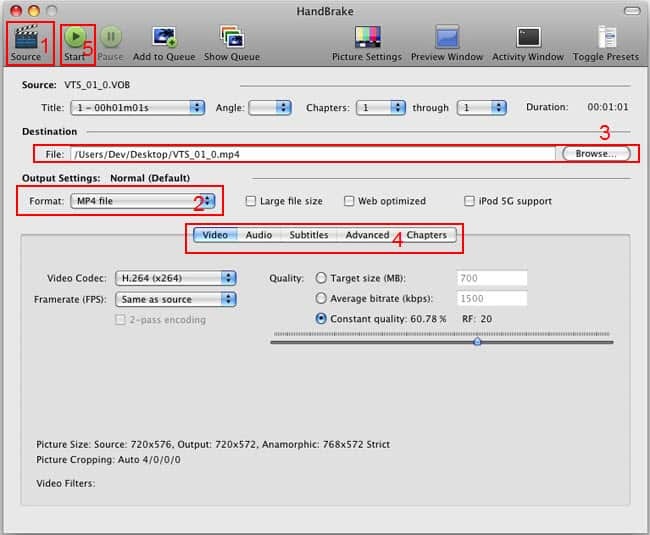 Users may stumble upon problems like Handbrake audio video out of sync, Handbrake no valid source found etc. when free converting DVDs. Review: It is time consuming to find free DVD converter software for Mac. Frequent update of OS X El Capitan makes it even harder for free Mac DVD converter compatible with the new Mac OS. Unfortunately, this Mac free DVD ripper can not run on the latest El Capitan, but it works fine on old Mac OS. Users are offered access by the free DVD decrypter to convert DVDs to SD & HD video format, like free converting DVD to MP4 on Mac, DVD to MKV, AVI, etc. What you need to notice is that the free DVD conversion software can not be used to copy new released DVDs, especially DVDs from Disney, Paramount, and the likes. The free DVD converter can be downloaded for both Mac OS X(Mojave included) and Windows(Win 10 supported). The free DVD conversion software can 1:1 copy protected DVDs to ISO Image, MP4, AVI, MOV, MKV, etc. and to iPhone 6s/Plus, iPad Pro/Mini 4, any digital video format and mobile devices with no quality loss. Review: The most appealing point this free DVD converter for Windows shows is that it supports converting DVDs to various video formats, MP4, AVI, MOV, MKV, 3GP, VOB, FLV, and other commonly used digital video formats. DVD video editing function is a plus, the free DVD ripper is able to add watermarks and SRT subtitles to converted DVDs. This free DVD decrypter can copy protected DVDs, only limited to DVDs using outdated copy protection technology, the Disney DRM X-project encrypted DVDs can not be copied by the free DVD conversion software. It is supported by ads, and works on merely Windows 8 or older. Format Factory for Mac alternative is needed if you are a Mac user. Review: The free DVD converter software is able to convert DVDs to MP4, 3GP, MOV, MKV, AVI, FLV, MPG and WMV digital video file format. It is very easy to convert DVDs for free thanks to a well designed interface. The free DVD converter copies DVDs, and offers no other extra features. The free DVD decrypter can hardly convert encrypted DVDs, not to mention Disney DRM X-project copy protected DVDs, like copying Inside Out DVD, Zootopia, Alice In Wonderland, Jungle Book, etc. The free DVD to MP4 converter can be downloaded for Windows 7, if you've updated to Win 10 or Win 8, you have to switch to other free DVD copy software. Review: The Free DVD Converter from ConverterLite allows you to convert DVD to plenty many video formats, MP4, MKV, AVI, MOV, FLV, etc. Other bonus feature the free DVD ripper provides is advanced settings for further converted DVDs editing, like adjusting output resolutions and bit rate. The free DVD to MP4 converter lets users directly convert DVDs to Apple iOS device, Samsung, HTC, etc. which is quite convenient. But if you want to rip protected DVD free on Mac, obviously, this free DVD conversion software is not the right one. The free DVD converter can be downloaded for PC running Windows 7 or older. Review: The free DVD converter is capable of ripping DVDs to MP4, AVI, DivX, XviD, VCD etc. commonly accepted formats by DVD players for Mac or Windows. 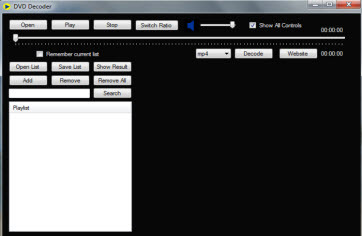 It can extract MP3 audio music file from DVDs as well. For advanced users, the DVD converter freeware allows to adjust output converted DVD video frame rate, codec, contrast etc. There's small chance for the free DVD decrypter to deccrypt & convert encrypted newly released DVDs. The free DVD ripper only supports Windows 7 or older, which means Win 8, 10 and Mac users are out of the luck to use the ripper to convert DVDs for free. Note: Few free DVD converter is frequently updated to support the latest OS and newly released DVDs. If you are using a computer with old OS, and have many homemade non-protected DVDs, free DVD conversion software works. If you require more, switch to free DVD ripper MacX DVD Riper Mac Free Edition pro version, MacX DVD Ripper Pro that converts any protected DVDs to any video formats, any mobile devices with fast speed and zero quality loss. Bonus features are added, like compressing DVDs, adding subtitles, trimming, cutting, repairing scratched DVDs, and many more. Hot tips: you may want to watch the DVD movies ripped with the free DVD converters on iPhone iPad. In this case, you can either use iTunes, or try an easier method with MacX MediaTrans. This iTunes alternative will transfer ripped DVD movies from computer to iPhone iPad iPod by simply drag and drop, automatically removing any formats incompatibilities by converting MKV, FLV, AVI, WMV, MTS, VOB more into iOS accepted formats with perfect size, quality and rotation. If you looking for free movie converter for Mac to rip DVD movies and convert movie videos, hrere best free movie converter Mac (macOS Mojave/Sierra/El Capitan/Yosemite) will help you convert DVDs/movie videos into MP4, MOV, MPEG, FLV or iTunes for Mac, iPhone, iPod, iPad or mobile phone. Seven Free DVD Ripper, Which Wins Your heart? Love it, Vote for it! MacX DVD Ripper Pro is the best DVD converter which can freely remove any copy protections from DVDs and rip DVDs to various video formats (MP4, MOV, MKV, AVI, FLV, etc) and portable devices with original quality.